MarkTier.com | Did God Evolve? When Moses led the Israelites from Egypt, they brought their monotheistic God, Yahweh, with them and proceeded to wipe out the Canaanites and occupy their lands. 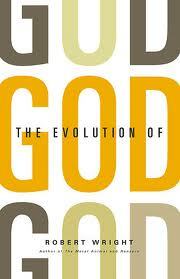 But to go by Robert Wright’s exposition in his book, The Evolution of God, it’s wrong on every count. First, there is no archeological or other evidence to suggest that the Exodus from Egypt ever occurred (certainly not on the scale depicted in the Bible). Rather, the available evidence suggests the Israelites were once Canaanites — and POLYtheistic too boot. Second, Yahweh was originally a Warrior God — one of the many Canaanite gods. Slowly, over time, Yahweh evolved into the gods’ “chairman of the board” (rather like Jupiter/Zeus of the Roman/Greek pantheon), becoming the sole Israelite god only in the second century BCE — “God” instead of “a god” (see, for example, Psalm 82). Thirdly, Yahweh was originally anthropomorphic, like most pagan gods: he walks in the Garden of Eden looking for Adam and Eve after they had eaten the forbidden fruit; he has “human” characteristics, showing anger and jealousy; he made “garments of skins” for Adam and Eve; met Jacob “face to face” and he even met Moses and 70 elders of Israel who “saw the God of Israel”; later, he becomes non-anthropomorphic and no longer shows himself. Wright convincingly amasses verification from history, archeology and even the Bible itself which still contains traces of polytheism. Then he goes further, showing how Yahweh’s very personality changes depending on circumstances. To simplify his analysis, when Israel is ascendant over its neighbors, the vengeful, wrathful Yahweh of the Old Testament comes to the fore to smite Israel’s enemies. When Israel is at peace and the Israelites perceive it to be in their interests to be friendly trading partners with their neighbors, the kindly side of Yahweh rules. When the Israelites are oppressed and persecuted, they take comfort in how Yahweh will take revenge on their enemies — sometime in the unspecified future. Wright detects the same pattern in Christianity and Islam (and, to a lesser extent, in other, non-monotheistic religions), and his analysis of how Paul took Jesus’ obscure Jewish sect and turned it into a world-wide religion is riveting, as is his study of Mohammed and the beginnings of Islam. As with evolution in nature, the evolution of God (and gods) continues — a never-ending story. The retreat of Christianity in the face of science and religion (among many other things! )Believe you have to “predict the market’s next move” to make money? You need to read this book!